Asik got his first chance to play professionally with the Turkish Basketball League team Fenerbahçe in 2005–06. After one season with Alpella, Aşık moved back to Fenerbahçe and eventually ended his Turkish club career with them in 2009–10. He gained recognition playing for the Turkish national team in the 2010 FIBA World Championship, and as the starting center, he helped Turkey win the silver medal. In July 2010, Aşık signed with the Chicago Bulls. He was nicknamed "The Turkish Hammer" and "Asik and Destroy" by Bulls commentator Stacey King. Aşık was traded to New Orleans last season after spending two in Houston and two in Chicago. He signed a five-year contract for $58 million last summer in which $45 million is fully guaranteed. Last season, the young player scored at least 10 points in 20 games. He also ended last season with a 9.8 rebounding average. 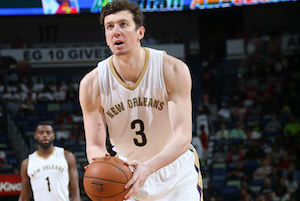 New Orleans also allowed 103.3 points per 100 possessions with Asik on the floor, as opposed to 106.2 when he sat.